Here’s the dark, dirty secret about my trip to the Wizarding World of Harry Potter: I fully expected to be disappointed. I feel horrible admitting it, but the closer I got to leaving for Orlando and the more excited I got about going, the more I convinced myself that it wasn’t going to live up to my expectations. There was just no way it could. 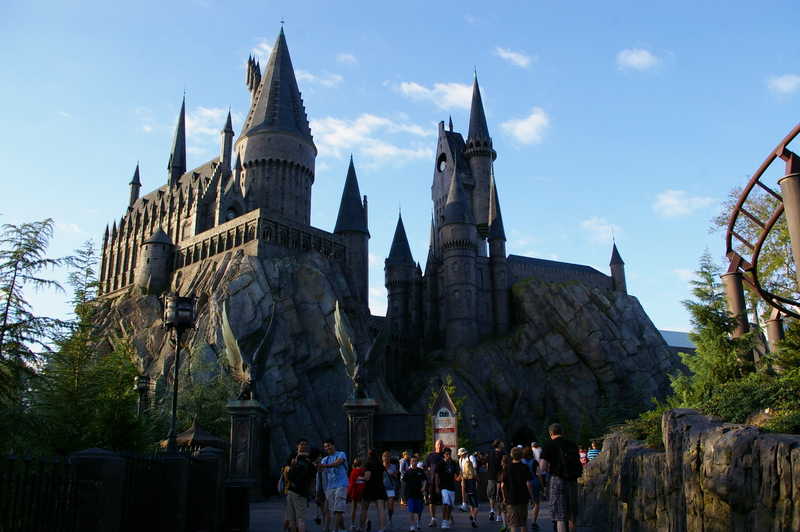 Well maybe it was because I was prepared for the cheesey worst, or because I went at a time when the crowds were managable and the weather was perfect, but I can say, as a true Harry Potter fan, I was nothing but impressed and completely delighted with the entire experience. Yes, it’s a theme park. It has to be kept clean-ish so you won’t find big spider webs everywhere or dripping sinks and creaky wood floors. But they’ve also been careful not to include anything you wouldn’t actually see in Hogsmeade. So there aren’t any posters advertising the new Harry Potter movie. 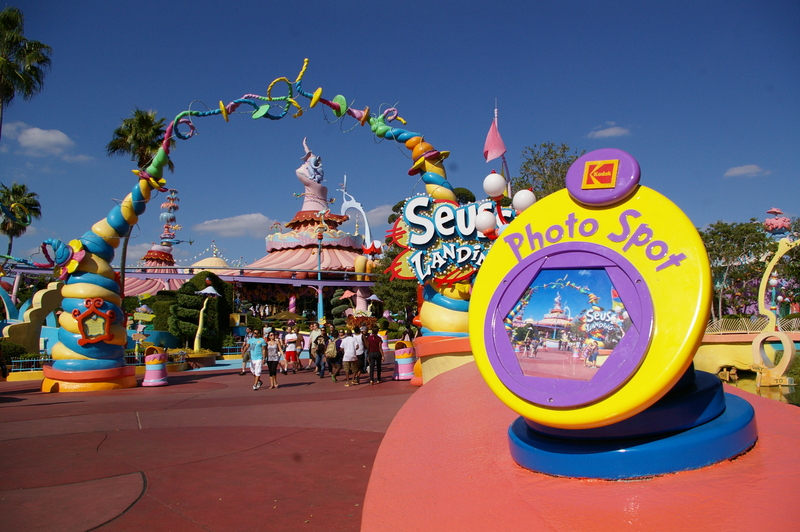 There are no signs pointing you to Seuss Landing. There is no Coca Cola. Flight of the Hippogriff: This is a kiddie rollercoaster but I still loved it. Buckbeak sends you on your way with a bow and Hagrid’s cottage is nearby. Harry Potter and the Forbidden Journey: Before you even get to the ride you get to walk through Hogwarts, which is pretty incredible. The stairway to Dumbledore’s office, the house points, the Fat Lady, the Sorting Hat – it’s all there. The ride itself is part rollercoaster, part 3D-ish flying ride. It might make you a little motion sick, but you’ll be laughing and shouting too much to notice. Filch’s Emporium and Dervish & Banges: Lots of shirts and pillows and keychains and stuffed owls in these places. 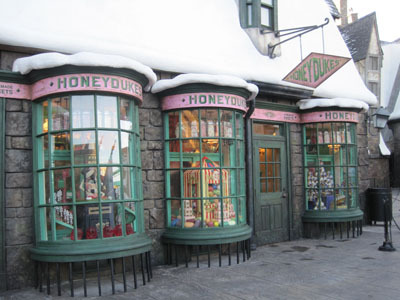 Hogwarts robes will cost you around $100, but there are plenty of more affordable souvenirs as well. 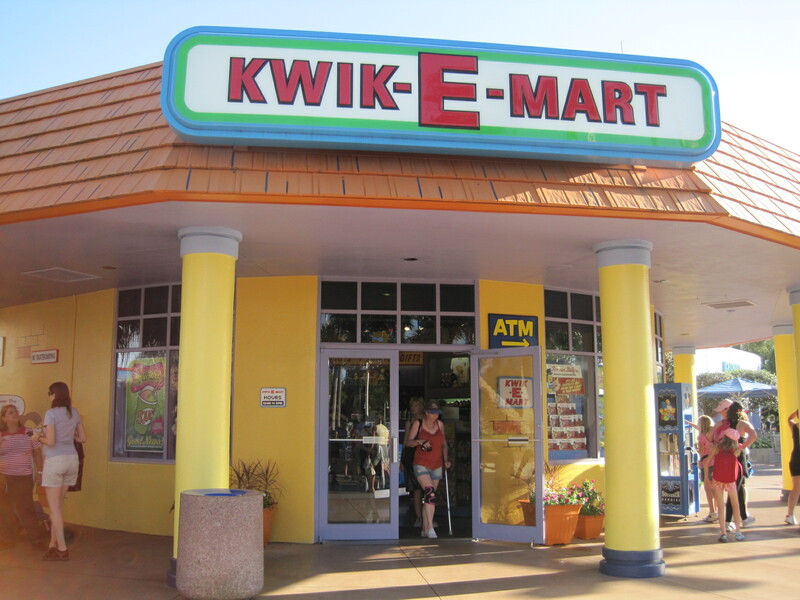 The hot weather kept me from buying up all the chocolate cakes and goodies in here on my first day, but on my last night, I loaded up. Honeydukes: Get yourself a cauldron cake. That’s all I’m saying. Zonko’s: I half expected to see the Weasley twins hanging out here among the wacky and sometimes gross tricks and treats. U-No-Poo? Yes, they’ve got it. The Owl Post: If you buy some postcards, take them outside Dervish & Banges, in the covered seating area. There will be someone standing at a wood podium – with no sign saying why they’re there – who can postmark them with a Hogsmeade ink stamp. You can also buy Harry Potter postage stamps in Dervishes or at the stationary kiosk near the wood podium, but they’ll cost you $15 for 10 stamps, so save them for the people who will really appreciate them. You have to have a meal at The Three Brooksticks. Preferably an English meal, but if Shepherd’s Pie isn’t your thing you can have a turkey leg or something else. If you get a package deal with Universal it may include a reservation. If not, get in line early for lunch. 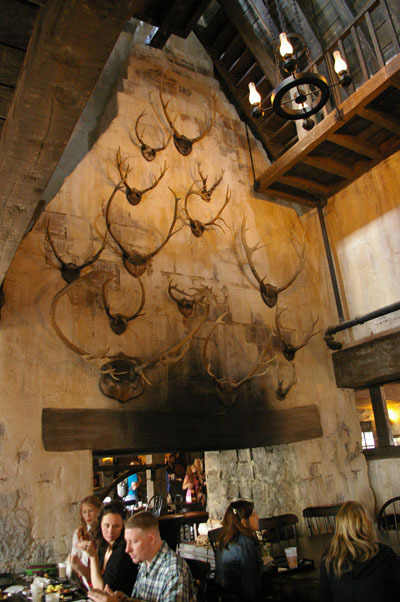 The Hog’s Head is part of the same big building as the Three Broomsticks, but you can walk right in and order a drink at the bar. Go out back for a shaded table and a view of Hogwarts. Butterbeer and Pumpkin Juice: You can get these at both pubs or at one of the outdoor kiosks. Pumpkin juice is a bit like apple cider with some pumpkin pie spices mixed in and Butterbeer is like cream soda with an incredible caramel whipped cream on top. It wasn’t as butterscotchy as I expected, but I still drank three of them. Get the plastic mug (for a nice extra fee) and refill it with soda or iced tea anywhere in the park for something like .85. If you’re there for a few days, that’s a nice perk. 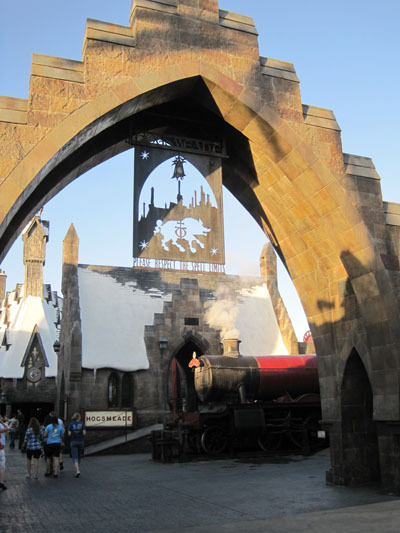 At some point during the day the Hogwarts Frog Choir will perform near the Dragon Challenge rollercoaster. Also throughout the day you can see the Tri-Wizard Spirit Rally by the Beauxbatons and Durmstrang students, and they pose for pictures afterwards. The schedule fluctuates so ask at the front gate for a timetable. 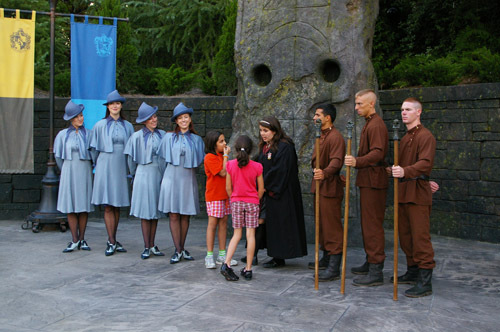 Don't leave without saying hello to some of the visiting students from Beauxbatons and Durmstrang. They put on shows throughout the day. Ollivander’s: This is a show that they put on for groups of 10-12 people at a time, but it’s in Ollivander’s tiny shop, so this might be one of your longest waits. Do it first thing in the morning, on your way to the castle. As if all this isn’t enough, you can also see the Hogwarts Express steaming away, admire Hermione’s Yule Ball dress and dozens of other wizarding artifacts in the fake shop windows, get money at a Gringott’s ATM and in the women’s restroom… well, I’ll let you figure that one out. My final tip is to see this place at sunset. When the sun goes down, the town and the castle look truly magical. I took at least 200 pictures just in the Harry Potter area of Universal’s Islands of Adventure. Here’s a peek at some of my favorites. Our first view of Hogsmeade, and it's perfect. The hot weather kept me from buying up all the chocolate cakes and goodies in Honeydukes on my first day, but on my last night, I loaded up. You have to have a meal in the Three Broomsticks. Also stop into the Hog's Head next door for a Butterbeer, or a real beer, and head out back to their patio. There's a great view of the castle from there. 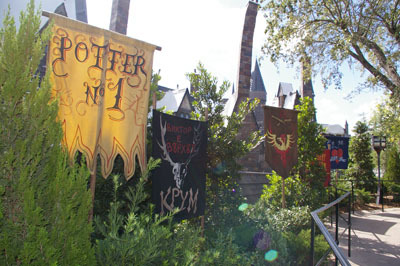 You'll feel like you're headed to a massive pep rally thanks to all the Tri-Wizard Champion signs leading up to the Dragon Challenge rollercoaster. 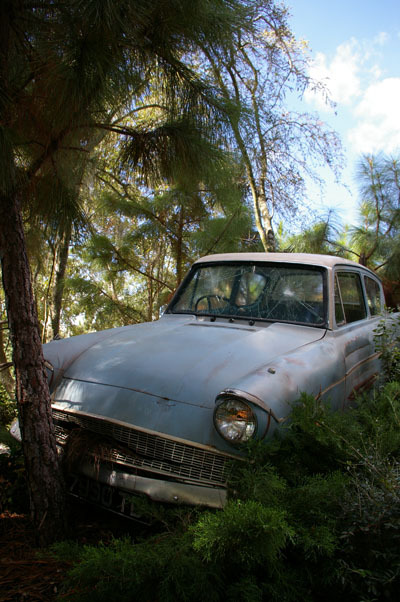 The only way this car would have been cooler is if it had some Weasleys in it. Preferably the twins. I freaking love the twins. This morning I watched the live stream of the London premiere of “Harry Potter and the Deathly Hallows, Part One”. The cast all looked awesome and it put me back in the Harry Pottery mood I felt when I was in Orlando. I had an incredible time at the Wizarding World of Harry Potter, and the rest of Universal Orlando, and picked up some good travel tips for you, so here you go! Not in the summer. I knew ahead of time I didn’t want to fight huge crowds and I’m really glad my friend and I waited until October to visit Hogsmeade. Er… Orlando. The weather was still gorgeous and sunny but wait times for rides tended to be 15-30 minutes instead of 2-4 hours. In the early morning and late evening (when the little kids are still asleep or have pooped out for the day) we walked on to most rides, so we got a lot more enjoyment for our money with much less hassle. So, as with most really popular destinations, the off season is the best season. This is a trickier one because there are so many ticket variations available. The longer you stay the less you pay per day. For example, right now a 1-day ticket, which you can use for both Universal parks, is $112 for an adult. A 3-day ticket is just $144.99, so less than $49 a day. Not all tickets allow you to go between parks whenever you want to though. The package I got came with a Base ticket, which meant that each day we had to decide which park we wanted to visit. We couldn’t do half a day in one park and half a day in the other. That worked out fine, but it would have been nice to have the ability to spend a few hours with Harry Potter each day, then maybe hop over to the other park and to do the Mummy or Simpsons ride. Once you decide whether you want to be able to go between parks whenever you want (called Park to Park Access), then you can decide if you also want to upgrade to an Express Plus Pass. This is the pass that lets you skip the lines and go right to the front. Or at least close to it. The Express Pass is good on almost every ride except Harry Potter and the Forbidden Journey™, because if you skipped that line you’d also skip the whole walk through Hogwarts castle, which is part of the fun. Since we didn’t hit any big lines I didn’t mind that we didn’t pay the extra $25 or so a day for Express perks. However, skipping the line means you don’t have to spend several minutes winding through all the aisles and walkways where the big lines normally go to get to the ride, which means less walking. On my last day, with my swollen, blistered feet, that didn’t sound like such a bad idea. So what’s the difference between these two parks anyway? Do you even need to see both? Yeah, you do. Universal Studios is based on the park in L.A., where actual movies are made. The different areas of the park are made up like different movie lots – old New York, “Jaws”-era New England, the San Francisco wharf, Hollywood. Buy your Flaming Moes here. The rides are mostly movie-based, like “Twister”, which lets you feel what it’s like to be on a movie set with special effects going on all around you. “Revenge of the Mummy” is similar to Disneyland’s “Indiana Jones” ride, taking you through old tombs and pyramids, and the boat ride lets you see the great white shark of “JAWS” up close and personal. It was “The Simpsons Ride” that I enjoyed most though, probably because I had no idea what to expect. I thought it was just a simple roller coaster, but it was way, way cooler that that. “State-of-the-art digital projectors cover an 80 ft. diameter dome surface with an image four times the standard High Definition found in most home theaters, and twice what you’d experience in a normal digital theater.” And it really makes you feel like you’re travelling through Springfield, along with all of your favorite characters. 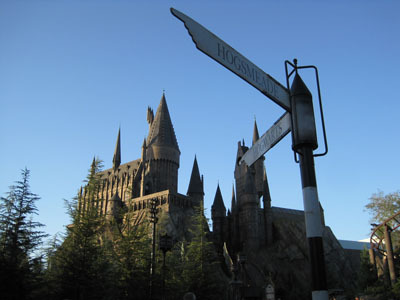 Islands of Adventure is a mix of comic book heros, favorite kids characters, Jurassic Park dinosaurs and Harry Potter. Smaller kids can probably do more here, but there’s plenty for grownups, too, and my friend and I weren’t the only adults having a great time without kids. Comfy shoes. We spent 14-18 hours walking around, standing in lines and generally abusing our feet. Even with my best walking shoes, it made for some unhappy feet. Bandaids. At least if you get a blister you can wrap it up and keep it from getting worse. Snacks. I brought little packs of trail mix, some hard candies and a granola bar. It helped me spend a little less on food and waste less time waiting in food lines. Cash. Most places take cards, but if you want to stop at a little stand for a bottle of water, or mug of Butterbeer, you should have your cash ready. Fingerprints. Right, so you can’t pack these, but you’ll have a hell of a time doing anything without them. For the bigger rides, you aren’t allowed to bring any bags or loose items with you, so they have lockers you rent for free while you’re in line. It’s a great idea, except that to rent and open your locker, you have to use a touchpad and give a fingerprint. I apparently don’t have any. Every time I tried I wound up getting an attendant to open the locker for me. Very annoying, although I have lots of new ideas for a life of crime. In the meantime, for folks in the U.S., check out this awesome contest where you could win a trip to Africa with Will Smith and Jada Pinkett. Good travellers don’t just see the world, they take care of it. Make your own committment to help the earth and the other humans who live here! You are currently browsing the Student Travel: Cheap Thrills from Around the World blog archives for November, 2010.